Classical Net Review - Great Recordings of the Century - Milstein, Gieseking, Munch, Furtwängler, Beecham, etc. EMI Classics' "Great Recordings of the Century" series now contains around a hundred titles, all at mid-price, and all featuring digital remastering that makes them a comfortable part of our new century. For older collectors, the opportunity to be reacquainted with old favorites should be irresistible. For less experienced collectors, one could do worse than to build an entire collection from this series alone. The recordings reviewed here were reissued in the fall of 2001. The solitary violin concertos by Beethoven and Brahms make intriguingly contrasting discmates. Most performers, therefore, find themselves more attuned to one than to the other. 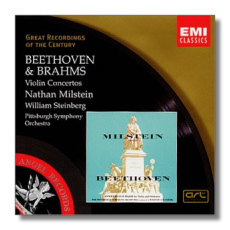 I had expected Nathan Milstein, given the objective purity of his recordings of Bach's Sonatas and Partitas for Unaccompanied Violin, to excel at the Olympian Beethoven concerto, and to be less comfortable with the volatile Brahms. In fact, the opposite is what happens here: the Brahms is solid, and the Beethoven is equivocal. The first whiff of something short of perfection comes just moments into the Beethoven, where the thin tone of the Pittsburgh violin section creates a less than generous impression. Steinberg's conducting is intelligent, but his fast tempos also decrease the cool serenity of Beethoven's themes and their development. As for Milstein, his interpretation this time around seems to be inspired by Heifetz – not a bad thing, but only if you're another Heifetz! Milstein's cadenzas are odd. The performance has lovely moments, but it fails to gel much of the time, except in the final movement. On the other hand, in the Brahms, Milstein and Steinberg turn similar raw materials into a more cherishable end-product. Again, the tempos move along, but not to the detriment of the music's character, and the pungency of Milstein's tone complements the emotions of Brahms' music – now assertive, and now elegiac. His playing is cleaner here, too. The orchestral sound is more sinewy than suave, but that has the advantage of clarifying the thickness of Brahms' writing. The Beethoven was recorded in 1955 in a single day; the Brahms in two days – November 29, 1953 and April 13, 1954! Not even a gap of four and a half months could unravel this performance. The monaural sound, while hardly hiding the tonal shortcomings of the playing, has held up well. 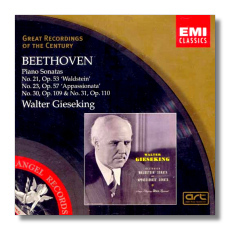 EMI intended to have Walter Gieseking record all 32 of Beethoven's piano sonatas, but the pianist's premature death in 1956 prevented that plan from coming to fruition: in the end, he recorded only 23 of them. The more famous ones – the "Moonlight" and the "Pathétique," for example - have been reissued several times. This new "Great Recordings of the Century" reissue is more enterprising because it includes less familiar material. Gieseking is at his technical and interpretive best in Sonatas #30 and 31, which he recorded in the summer of 1955. The final variations from #30 are transcendentally beautiful; the pianist seems to be playing with his head in the stars. Gieseking's expertise in Debussy and Ravel – the half-lights, the shadows, the luminosity – pays dividends to Beethoven when he is at his most metaphysical. The same is true for the finale of the "Waldstein" Sonata, which is a miracle of understatement that says much. At the same 1951 sessions, Gieseking recorded the "Appassionata," a less successful reading simply because the pianist's technical foibles get in the way too often. He couldn't (or, more likely, wouldn't) create storms of rage in the outer movements, and so his reading has a curiously detached quality. Some critics and fellow pianists thought that Gieseking was too unwilling to identify with the earthy side of Beethoven's nature. The "Appassionata" gives them ammunition. All in all, though, this CD contains provocative and often sublime pianism. The sound is faded, and, in the earlier sessions, distorted. There's probably not much that EMI's digital remastering facilities could do about that. 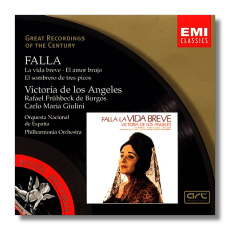 The focus of the de Falla CDs is the singing of Victoria de los Angeles, who appears in all of the works (albeit only briefly in El sombrero de tres picos). The surprise for me here is her performance in El amor brujo, where she casts aside her trademark purity and approximates the cante jondo style of flamenco singing. (She also adopts the appropriate regional dialect to good effect.) Giulini gets excessively refined playing from the Philharmonia Orchestra in this recording, which curiously was made over the course of three and a half years. (The other works are conducted – very well – by Frühbeck de Burgos.) In La vida breve, the soprano is a heartbreakingly fragile Salud, and the entire performance, recorded in 1965 in Madrid, ideally captures the opera's dismayingly fatalistic atmosphere. Strong choral work by the Orfeón Donostiarra and the flamenco vocals by Gabriel Moreno also make this performance a must-have. El sombrero de tres picos is another standout. Here, Frühbeck de Burgos and the Philharmonia combine color with control, and the music both insinuates and excites. One feels the tension steadily being ratcheted up as the 40-minute score moves forward. Again, it is curious that a span of six months and two locales were required to complete this recording, but the music doesn't suffer. The bonus selections in this de Falla collection are not negligible. De Los Angeles (with pianist Gonzalo Soriano) is as memorable as Conchita Supervia was in the Siete canciones populares españolas, and the engineering is far more modern. The two songs, Psyché and Soneta a Córdoba are exquisite miniatures. For example, Munch's Boston recording of Boléro, which dates from March 1962, lasts a few seconds under fifteen minutes. His Paris recording, as reissued here, clocks in at 17:08. The corresponding gain in sexually charged languor can't be denied. Tempos are also significantly slower in this Rapsodie españole than they were in the Boston recording (also from March 1962), and this is true for the Honegger Second Symphony too (recorded in Boston in March 1953). This isn't the slowness of an old man for whom everything is running down. Instead, this is the slowness of a conductor who loves the music so much that he wants it to last longer, and to be heard in all of its detail. In that characteristic, Munch resembles the meticulous Sergiu Celibidache, whose performances became slower and slower with age. Cons are the occasionally unrefined playing of the Orchestre de Paris (an ensemble formed by Munch himself in 1967) and the absence of a chorus in the Daphnis suite. Pros are the intensity and commitment that can be heard in every performance, and the splendid engineering. (The recordings were made in Paris's Salle Wagram.) 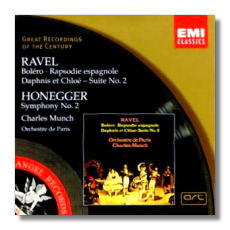 To my ears, Munch clearly outdoes himself in the Honegger, and he is no slouch in the Ravel works, either. 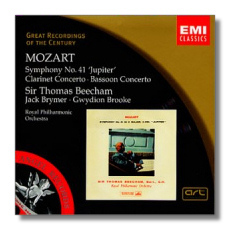 More than forty years old now, Beecham's last Mozart recordings are eternally young. Since the late 1950s, we've become much more informed about the manner in which Mozart probably expected his music to be played; matters of tempo, phrasing, and even the instruments themselves have been reexamined in the search for authenticity. Strangely, while those factors can help us to connect with the composer on a purely physical level, they are of little use in connecting with him emotionally. Sir Thomas Beecham probably would have dismissed many of the fruits of today's scholarship with a caustic joke. These recordings prove that musical communication needn't be a tale of mystery - sometimes the direct approach is the best. The "Jupiter" is characterized by masculine grace. Beecham shapes every phrase with the highest regard for maintaining the music's momentum, yet without sacrificing its supremely regal unfolding of one new melody after the next, and the purposeful yet unhurried development of the music's materials. The second movement is serene, sad, yet never tearful, and the Minuet (while too slow for dancing) is all grandeur and human warmth. With Beecham, the certainly "grand" finale is unhurried – the excitement comes from the conductor's control and taste, a few rescored sections notwithstanding. The two concertos feature wind players from Beecham's Royal Philharmonic. Both play the music with healthy tone, and with the same mixture of physical leisure and emotional compulsion heard in the "Jupiter" Symphony. These recordings were made almost at the spur of the moment, and using movement-long takes, but the results could not be more assured. Brooke plays his own cadenzas in the Bassoon Concerto. In terms of sound quality, Beecham's Mozart shows its age, but not much. Made in genuine stereo, these recordings have retained their warmth in this digital transfer. The newly reissued Tristan und Isolde, recorded in 1952, has attained classic status because experience – as personified by Furtwängler, Flagstad, and Suthaus – complements youth – as personified by Thebom and Fischer-Dieskau. In her late 50s, Flagstad was no longer able to sustain the beautiful high notes that once were hers, and so Elisabeth Schwarzkopf (still in her radiant youth) was deputized to interpolate a few of her own. It is hard to tell where Flagstad ends and Schwarzkopf begins; later in her career, not even Schwarzkopf claimed to remember, or to be able to tell the difference. This was a great controversy at the time of the original release, but it doesn't seem so important today. Another controversy was producer Walter Legge's shaky relationship with Furtwängler. (For example, Legge effectively prevented Furtwängler from ever making a commercial recording of Brahms' German Requiem, a work that was crucial to his repertoire.) Legge nearly departed the project, but reconciliation was crucial, because Flagstad refused to make the recording if Legge didn't produce it. Work went forward only after Legge signed a contract in which he agreed not to slander Furtwängler! Against the setting of this soap opera, the recording of the real opera took place. Flagstad's Isolde lacks freshness, but her ability to convey Isolde's emotional complexities through her voice and her understanding of the German language is unparalleled. Suthaus is terribly moving in Act III delirium, and always a heroic and convincingly romantic figure. 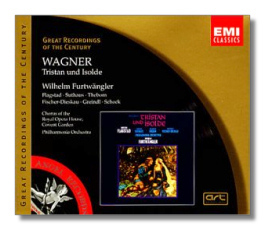 Fischer-Dieskau's Kurnewal is memorable for beauteous tone and his obsessive concern for Tristan. It is Furtwängler, however, who is the framework that this recording is built around. He conducts a spacious reading, yet he keeps the music moving along electrically with all the passion it deserves. The Philharmonia Orchestra plays with inspiration. The monaural recording is not ideal, but it is good for its age. This reissue contains all the bells and whistles one expects from a full-priced recording, including essays, the German text, and translations into French and English.